An iconic symbol of Brooklyn’s mighty Waterfront, the Tobacco Warehouse is a robust remnant from the city’s industrial past. St. Ann’s Warehouse plans to transform the pre-Civil War shell into a one-of-a-kind, year-round performing arts facility and community hub in the heart of Brooklyn Bridge Park. With its original brick walls intact, the building’s many scenic archways and windows will provide multiple points of access and views for community members from across the street to visitors from around the globe for decades to come. The 2012-13 season marked a year of transition for St. Ann’s Warehouse, as we recreated a temporary home for our much-loved open-space theater at 29 Jay Street and also began designs for a permanent home in the Tobacco Warehouse. We hope you will join us to celebrate the year and toast to our future! St. Ann’s Warehouse has chosen to honor Hank Gutman for his heroic service to the city, the borough of Brooklyn and the neighborhood. A member of numerous civic and charitable boards, Gutman has been deeply devoted to the decades-long effort to build Brooklyn Bridge Park, where he serves on the Board. He is also a strong proponent of the plan to transform the Tobacco Warehouse. Working together with State Senator Squadron, Assemblywoman Millman, Council Member Levin and the City, Gutman skillfully mediated a legislative and community agreement setting the stage for conversion of Empire Stores and the Tobacco Warehouse, to which St. Ann’s is the conditional designee. Norah Jones first emerged on the world stage 10 years ago with the February 2002 release of Come Away With Me, her self-described “moody little record” that introduced a singular new voice and grew into a global phenomenon, sweeping the 2003 Grammy Awards and signaling a paradigm shift away from the prevailing synthetic pop music of the time. Since then, Jones has sold over 40 million albums worldwide and become a 9-time Grammy-winner. She has released a series of critically acclaimed and commercially successful solo albums—Feels Like Home(2004), Not Too Late (2007), The Fall (2009), and Little Broken Hearts (2012)—as well as two albums with her country collective The Little Willies. 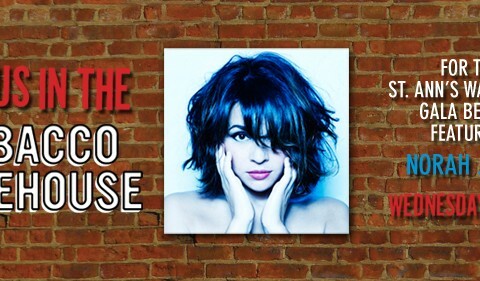 The 2010 compilation …Featuring Norah Jonesshowcased her incredible versatility by collecting her collaborations with artists as diverse as Willie Nelson, Outkast, Herbie Hancock, and Foo Fighters. Little Broken Hearts, which was produced by Danger Mouse, is the fascinating next step in the artistic evolution of one of the music world’s most consistently intriguing singer-songwriters. Jones previously collaborated with Danger Mouse on his acclaimed 2011 album ­ROME, a valentine to classic Italian film score music that also featured Jack White.